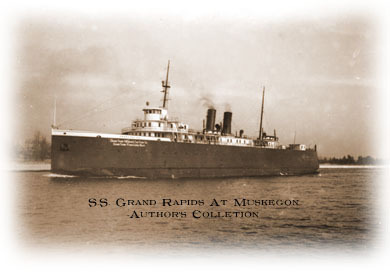 The S.S. GRAND RAPIDS was one of six ships built to the same design by the Manitowoc Shipbuilding Company. Built in 1926, she entered service for the Grand Trunk later the same year. Her sister’s included the PERE MARQUETTE 21 and 22, built in 1924, the ANN ARBOR NO. 7, built in 1925, the MADISON, built in 1927, and the CITY OF MILWAUKEE, built in 1931. She was built to replace MILWAUKEE (formerly the MANISTIQUE MARQUETTE and NORTHERN 1) lost in a storm with all hands in 1929. 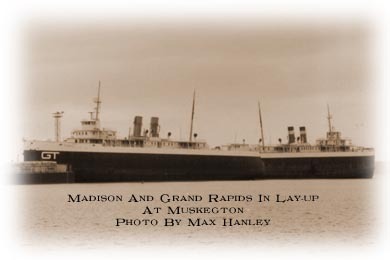 One of the more interesting mishaps suffered by the S.S. GRAND RAPIDS involved her sister-ship, MADISON . The MADISON was leading the way across Lake Michigan when she was struck from behind by the GRAND RAPIDS. One of her major modifications occured in 1967. She was cut in half and her spar deck was raised to handle taller railcars. She was taken out of service in 1970 and used for spare parts for her sister ships. She suffered two fires during the 1980s -- cause was not determined on one and second one (it was determined) was started by a would-be theif. She was eventually scrapped in 1989. October 23, 1926 -- The Grand Trunk carferry GRAND RAPIDS launched in Manitowoc. She entered service in December of 1926. December, 1926-- Grand Trunk Carferry GRAND RAPIDS entered service. December 8, 1927 -- GRAND RAPIDS, while entering Grand Haven, struck a bar that had been formed by storms about 150 feet off the pierhead. She lost her way and hit the south pier, suffering $11,000 damage. 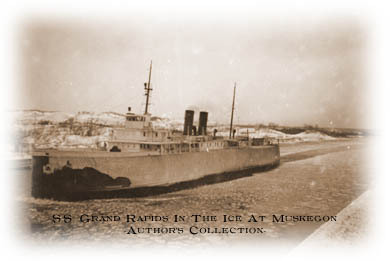 January 31, 1930 -- The Grand Trunk carferry GRAND RAPIDS collided with the MADISON from the rear while following her into Grand Haven after crossing in the ice. January 28, 1933 -- The Grand Trunk carferry GRAND RAPIDS, while apparently having trouble with her radio direction finder, ran aground near the Lakeside Power Plant south of the Milwaukee harbor entrance. Several officers were suspended and fined as a result of the incident. March 9, 1933 -- The Grand Trunk carferry GRAND RAPIDS struck bottom about 200 feet from the pierheads at Grand Haven while in heavy seas. She lost her way and struck the south pier, damaging several plates..
February 24, 1936 -- The Coast Guard cutter ESCANABA was enroute Grand Haven to break a path through the channel to free the Grand Trunk carferries GRAND RAPIDS and CITY OF MILWAUKEE. "The bridge at the Kinnickinic River in Milwaukee was a scene of a "standoff" between the C&O carferry CITY OF MIDLAND 41 and the Grand Trunk carferry GRAND RAPIDS. Both vessels arrived at the bridge at the same time, and neither vessel would give way to the other. The standoff lasted for approximately an hour until Captain John Assuma of the CITY OF MIDLAND backed his vessel and allowed Captain Walter P. Drummure of the GRAND RAPIDS to pass." July 25, 1959 -- The Grand Trunk carferry GRAND RAPIDS collided with the steamer DOW CHEMICAL. The American Steamship Company later sued the Grand Trunk-Milwaukee Carferry Company for damages. March, 1966 -- The Grand Trunk carferry GRAND RAPIDS was leased to the Ann Arbor Railroad fleet until May, 1966, for a reported rate of $750/day. October, 1967 -- The Grand Trunk carferry GRAND RAPIDS re-entered service after being cut in two lenghtways and raised at Manitowoc. 1970 -- The Grand Trunk carferry GRAND RAPIDS ceased operations and was used for spare parts for GTs other vessels. April 2, 1975 -- The State of Michigan filed a Federal Court suit to stop the Grand Trunk Railway from selling GRAND RAPIDS. It was felt that selling the ferry would build a stronger case for abandonment of the entire ferry service. September 9, 1980 -- The first of two fires suffered by the Grand Trunk carferry GRAND RAPIDS occurred on September 9, 1980. The cause of the fire was not determined. April 18, 1987 -- Fire caused extensive damage to the Grand trunk carferry GRAND RAPIDS, which was laid up at Muskegon. No one was on the ferry at the time of the fire and no injuries were reported. September 6, 1989 -- The Grand Trunk carferry GRAND RAPIDS was towed out of Muskegon to be scrapped.